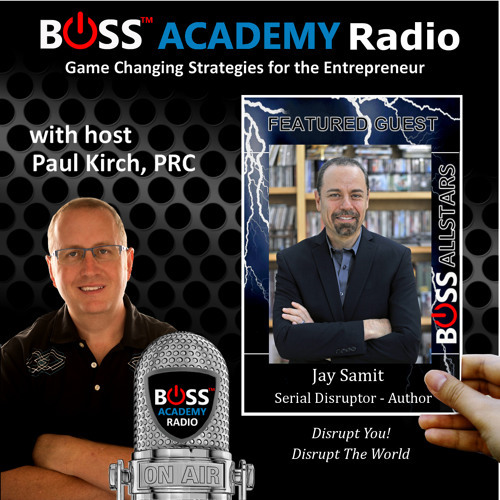 Today on BOSS Academy Radio, we bring you bestselling author Jay Samit, a dynamic entrepreneur and intrepreneur who is widely recognized as one of the world’s leading experts on disruption and innovation.&nbsp; Described by Wired magazine as “having the coolest job in the industry,” he raises hundreds of millions of dollars for startups, sells companies to Fortune 500 firms, transforms entire industries, revamps government institutions, and for three decades continues to be at the forefront of global trends. Everyone from the Pope to the President calls on Samit to orchestrate positive change in this era of endless innovation.&nbsp; Samit helped grow pre-IPO companies such as Linkedin, held senior management roles at EMI, Sony and Universal Studios, pioneered breakthrough advancements in mobile video, internet advertising, ecommerce, social networks, ebooks, and digital music that are used by billions of consumers every day.&nbsp; Combining innovation with commercial success, Samit is the consummate dealmaker; his list of partners and associates reads like a who’s who list of innovators, including: Bill Gates, Steven Spielberg, Steve Jobs, Reid Hoffman, David Geffen, Richard Branson, Paul Allen, and Pierre Omidyar. A proven trend spotter, Samit accurately predicts the future because he is constantly working with those who create it. &nbsp;&nbsp;&nbsp;&nbsp;&nbsp;&nbsp;&nbsp;&nbsp;&nbsp;&nbsp;&nbsp; An adjunct professor at USC, Samit teaches innovation at America’s largest engineering school and is author of the best-selling book Disrupt You! Master Personal Transformation, Seize Opportunity, and Thrive in the Era of Endless Innovation (MacMillan 2015). He is a regular contributor to the Wall Street Journal and host of its documentary series WSJ Startup of the Year. &nbsp;Samit frequently appears on ABC, Bloomberg, CBS, CNN, Fox, MSNBC, NBC and tweets daily motivation to the over 100,000 business professionals who follow him on twitter @jaysamit. An expert on transformational corporate change, Samit has been quoted in The New York Times, Harvard Business Review, The Economist, Businessweek, Forbes, Los Angeles Times, USA Today, Variety, Fast Company and TechCrunch. Samit is a change agent, who combines his bold vision and humor, to motivate audiences to become disruptors within their organizations.&nbsp; Samit gets people passionate about innovation, overcoming obstacles, and teaches them how to think bigger and embrace change.&nbsp; Samit motivates and delights audiences from Moscow to Mumbai, London to Las Vegas, Phoenix to Philadelphia, Berlin to Beverly Hills, Toronto to Tokyo, Seoul to San Francisco, with compelling keynotes that leave the crowd wanting more.&nbsp; Samit provides disruptive &nbsp;solutions for such corporate clients as American Express, AT&amp;T, Best Buy, Clinique, Coca Cola, Disney, Ford, GE, Intel, Linkedin, McDonalds, Microsoft, Proctor &amp; Gamble, Starbucks, Unilever, Zynga and dozens more. &nbsp;&nbsp;&nbsp;&nbsp;&nbsp;&nbsp;&nbsp;&nbsp;&nbsp;&nbsp;&nbsp; His keynote It’s Time to Disrupt You! is a high energy presentation on how to create and embrace change in any field.&nbsp; Designed to be as entertaining and inspiring as it is informative, Samit customizes each presentation to highlight the sales, marketing, and leadership goals of the audience before him. Samit delivers a speech that stays with the audience long after the conference has ended.